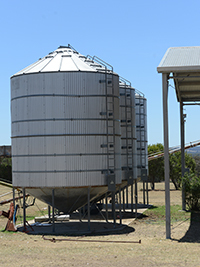 Located in the Central West slopes of New South Wales, Mobla Station is the operational base for our custom feedlot. With a long term average rainfall of 610mm per annum and an elevation of approximately 400m above sea level, the farm is an amalgamation of Mobla Station and Brooklyn Station combined, totaling approximately 6,346 acres of mainly flat to rolling country with creek flats that run along the Castlereagh River. Water is supplied by the river and also pumped from bores, which is then delivered to all the stock water tanks and water troughs, as well as to the 100 acre center pivot used to grow feed to fatten stock and grain for the feedlot. Our newly renovated custom feedlot is fully accredited by the National Feedlot Association Scheme (NFAS), ensuring quality, proper handling and traceability of all cattle fed in the feedlot. We take pride to ensure that all cattle are well looked after and in the best of condition when leaving the feedlot. The team at Mobla Station is led by our Head Station Manager, Michael Rapley, who lives on farm with his wife Michelle and two children, along with the farm staff. Michael joined the Crown State family in 2015, and is an integral part of our beef operation. He oversees the whole beef farming operation on all the properties and reports directly to the Directors of the company, ensuring that everything runs smoothly and according to the long-term management plan established.